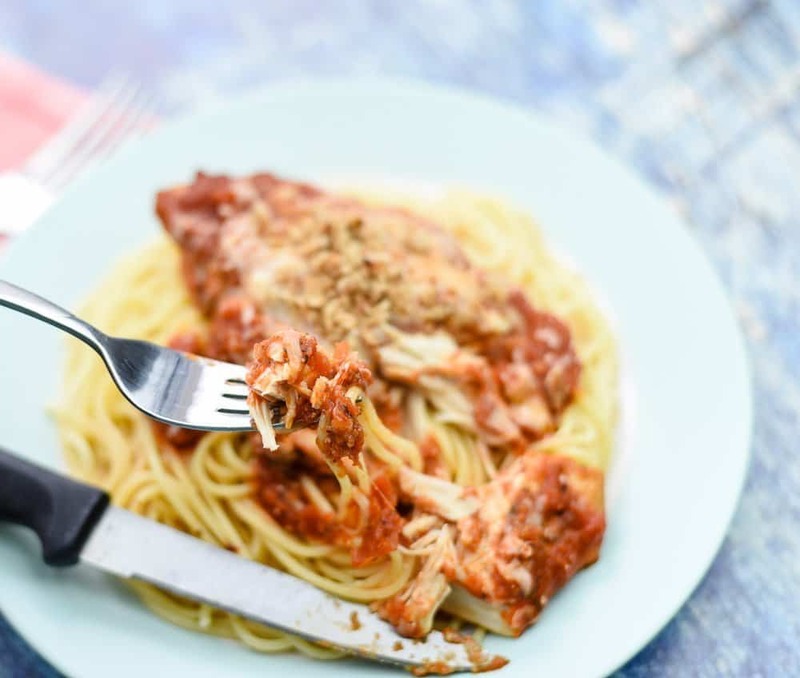 My family is crazy about my Simple Slow Cooker Chicken Parmesan. If you’re fortunate enough to have any leftovers, it’s even better the next day. I like to serve Chicken Parmesan over spaghetti, but you can use whatever type pasta your family prefers. Sometimes, I make Chicken Parmesan the traditional way – dipping the chicken in an egg and then in breadcrumbs. This way doesn’t work in the slow cooker. The breadcrumbs become soggy and it’s not very good. 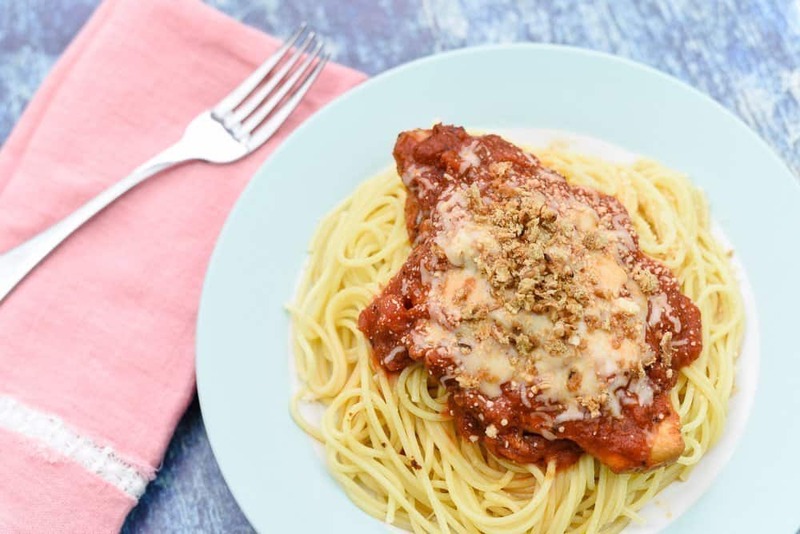 When I make Simple Slow Cooker Chicken Parmesan, instead of coating the chicken with breadcrumbs, I brown the breadcrumbs in a skillet a few minutes before the chicken is done. Then, I top each piece of chicken with the breadcrumb mixture right before serving. It must be good because my daughter-in-law asked me how I made the breadcrumb topping taste so delicious. Of course, when my large family comes over for lunch every Sunday, I have to quadruple this recipe. Thankfully, I have several slow cookers. This past Sunday, I used boneless, skinless chicken thighs instead of chicken breasts. The family loved the swap. Add a green salad, rolls (or garlic bread) and you’re good to go. 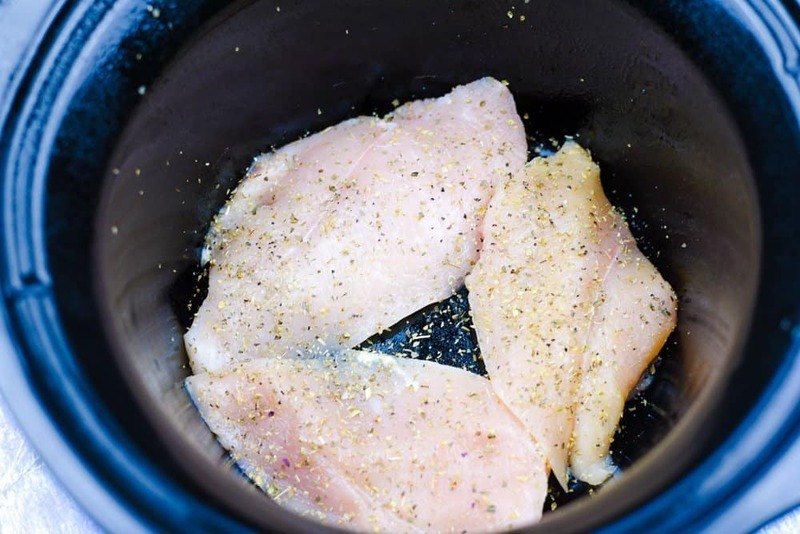 Place boneless, skinless chicken breasts in a slow cooker. Sprinkle with salt, pepper, and Italian seasoning. Pour Tomato and Basil Sauce over chicken. Before serving, top the chicken with shredded mozzarella, parmesan, and breadcrumbs. Serve over pasta (I use thin spaghetti). Helpful Hint: To make the breadcrumb topping, heat two tablespoons of olive oil over medium-high heat. Add 1-1/2 cups panko breadcrumbs. Cook 3-4 minutes, stirring constantly, until browned. Or, if you had rather make your own breadcrumbs, it’s easy to do. Place chicken breasts in a slow cooker. Sprinkle with Italian seasoning, salt and pepper. Pour pasta sauce over the chicken and cook on low for 4-5 hours. Just before the pasta is done, heat 2 Tablespoons olive oil in a skillet over medium-high heat. Add the breadcrumbs and stir until golden brown, about 3-4 minutes. Serve chicken over the pasta and top with cheeses and breadcrumbs. 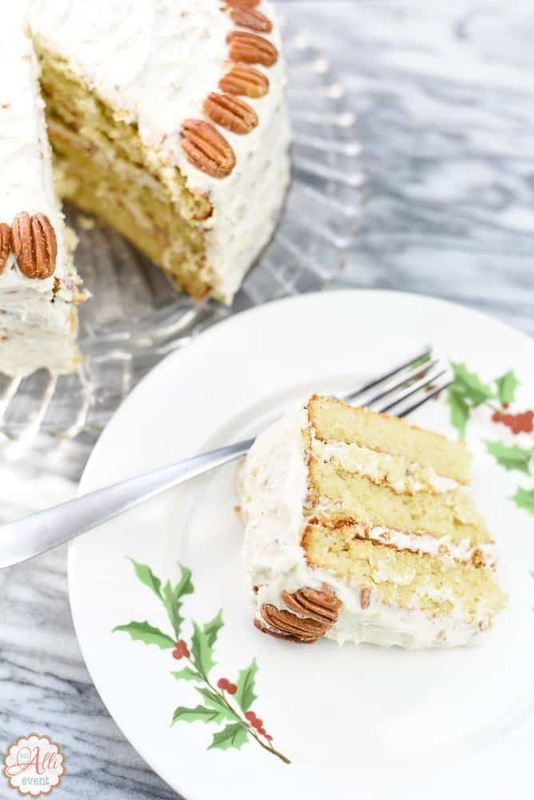 This is such a simple recipe and when my daughter-in-law asked if it was on the blog, I knew I had to add it. It’s a keeper! Can never have to many chicken recipes. When you throw in using the slow cooker it is a winner in my book. One of our favorites meals to fix. There are so many chicken recipes out there I love getting ideas for something that is simple and easy to do that tastes great! That looks so good. I love spaghetti. I could always eat spaghetti no matter what. 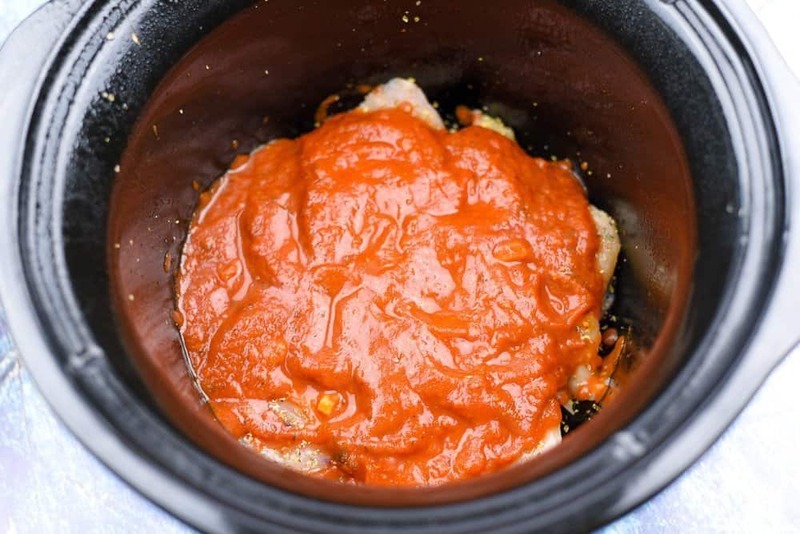 I never knew you could make chicken parmesan in a slow cooker. *Mind blown* My crock pot is my go to kitchen appliance. Love my Instant Pot but my tried and true is my crockpot. 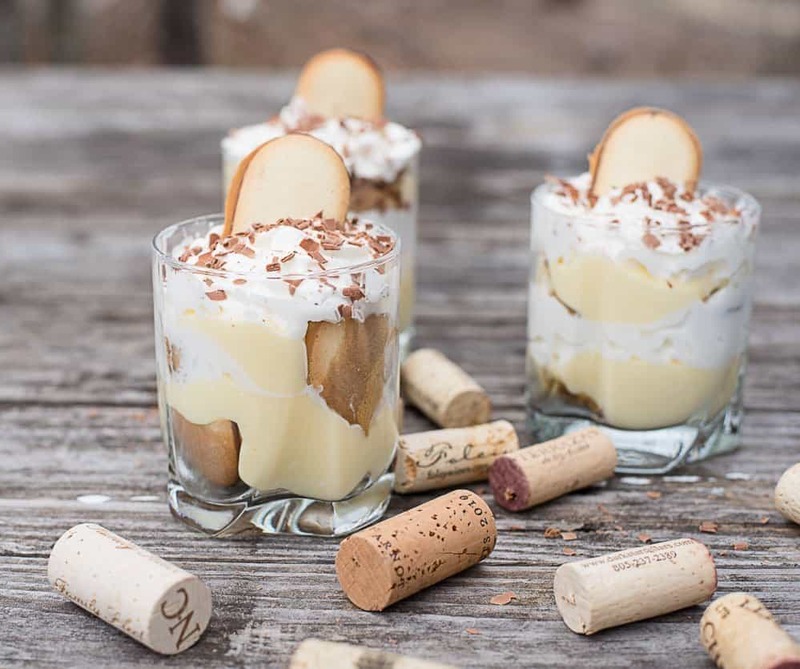 This is easily one of my favorite recipes you have posted. I have got to try this one. Sara Welch recently posted…Does my son have a girlfriend? Oh my goodness yes please! This is right up my street and that fact I can pop it in the slow cooker and leave it to sort itself across the day is just perfect. This looks so good! I am all for using our slow cooker, during the week we have so much going on and knowing that dinner is ready to go is amazing. I will have to give this a try! Oh this looks so good. I think I’m going to change up my menu planning next week and do this recipe instead! Thanks Alli! Wow, this recipe is a classic. It’s delicious and filling at the same time. I love preparing dishes like this during family meals so we can all enjoy it together. We love spaghetti at our home. Of course we do not eat chicken. But this recipe sounds good to try minus the chicken with veggies and cottage cheese. 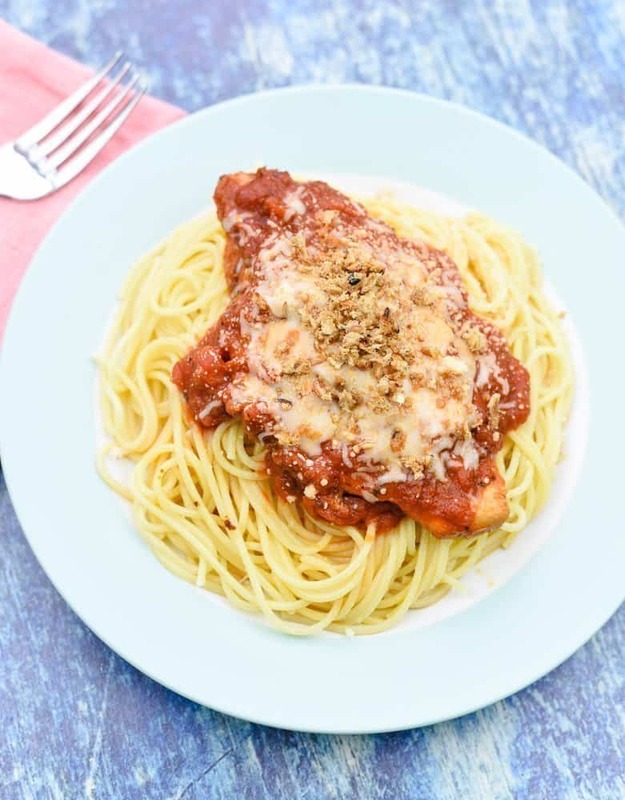 Slow cooker chicken Parmesan?? Yes please!! I need to make this ASAP!! Ricci recently posted…This is 35. I love your tip about browning the bread crumbs and then putting it on the chicken. It makes perfect sense for keeping the crumbs crisp. 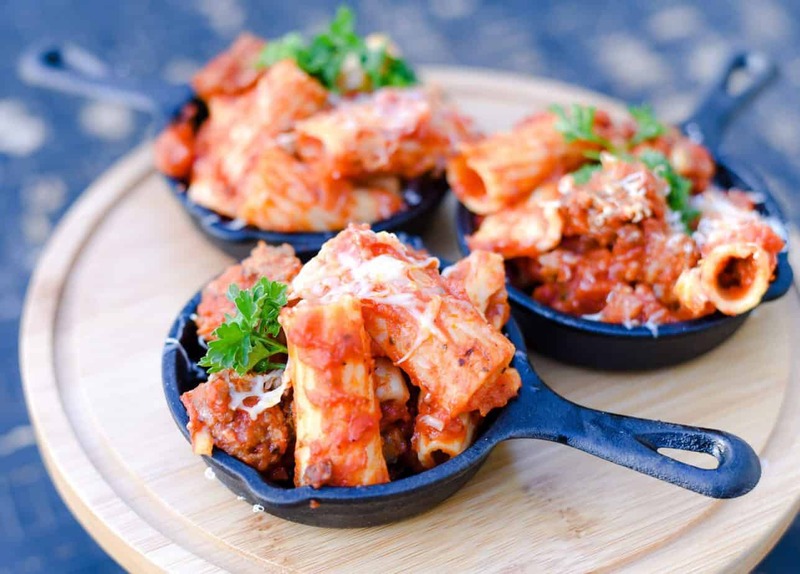 My husband who loves any pasta dish would love this. I would like to make this over the weekend! I love chicken parm and would never think to do it in a slow cooker. I always think of it fried, I may need to try this and see if my family would like it because these is SO easy! One more reason to love my slow cooker! I have never tried making chicken parmesan in a slow cooker but thanks to your recipe, I will now! Anosa recently posted…How has Life Changed in the past 100 Years! Hey Alli…..! Am a big fan of your slow cooker chicken and this looks soooo good & delicious; I will try to making this from your simple recipe tips. Thanks for sharing…keep shared your new idea with beautiful recipes….! I can’t make recipe better in slow cooker. But spaghetti with Parmesan is my favourite!